Managing Strategically in an Interconnected World Business is now at a new frontier as managers face an increasingly interdependent and interconnected world. Sparked by the technological revolution and globalization of business, an exceedingly complex and challenging competitive landscape has been created which has been referred to as the 'third industrial revolution'. Firms face significant uncertainty, ambiguity and an increasing number of strategic discontinuities in this hyper-competitive world. The key to survival for the modern business manager is strategic flexibility. This strategic flexibility will require innovation, speed and the use of information and knowledge. Only then can managers consistently find new methods of achieving competitive advantage. The editors have selected contributions that address two major themes of this new business environment and the means of managing strategically within it. Part I: Interconnected World: The Global Environment, Uncertainty and Knowledge Development looks at the rapid and largely unpredictable changes that occur, exemplified by the recent economic shocks in Asia and Russia and the political changes in Eastern Europe. Chapters in this section range from a focus on the central European banking system (of vital importance in the forthcoming changes in the EU to a single currency), to the executive strategic orientations in Chinese state-owned enterprises and managerial strategies of western companies in Asia. Further chapters explain the development and sharing of knowledge to build strategic flexibility. They explore how firms learn and thereby develop dynamic capabilities and core competencies. Part II: Interconnected Firms: The Role of Cooperation, Trust, Governance and Technology begins by examining how cooperative strategies have become a significant strategic tool in recent years, but why there is still a high failure rate of strategic alliances (the most common form of cooperation). The development of collaborative know-how is explored as well as the entrepreneurial opportunities that can be created by alliances to increase resources and develop new capabilities. Developing these new capabilities requires that firms have the necessary absorptive capacity and build trust with their partners. Even with trust, higher risk collaborative ventures, particularly between international partners, require governance. Trust in and governance of interorganizational partnerships within several different international contexts including Europe, Asia and North America is also explored. 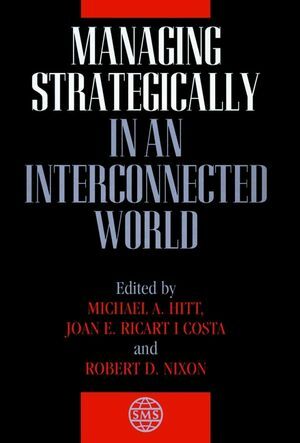 Thus, Managing Strategically in an Interconnected World addresses a number of critical issues to successfully navigate in the new frontier and build sustainable competitive advantages. Michael A. Hitt holds the Paul M. and Rosalie Robertson Chair in Business Administration at Texas A & M University. He received his PhD from the University of Colorado and has been chosen to receive an honorary doctorate from the Universidad Carlos III de Madrid in recognition of his scholarly contributions in business administration. He has authored or co-authored several books and book chapters and numerous journal articles in such journals as the Academy of Management Journal, Strategic Management Journal and Academy of Management Review. Furthermore, he has served as Consulting Editor (1988-90) and Editor (1991-93) of the Academy of Management Journal. He is a Past President of the Academy of Management and is a Fellow in that organization. Following Michael Porter (1994) and C.K. Prahalad (1995), he received the 1996 Award for Outstanding Academic Contributions to Competitiveness from the American Society for Competitiveness. Joan E. Ricart i Costa is a full professor in Economics and General Management at IESE. He is Chairman of the General Management Department and Director of the Doctoral Program. At the Universidad Politécnica de Catalunya (1978), he received a doctoral degree in Industrial Engineering in 1982 and was also professor there. From Northwestern University (USA), he received a Master of Sciences (1982) and PhD in Managerial Economics (1984); he is also a Doctor in Economics by the Universidad Autónoma de Barcelona (1985). In 1992-93 he was Research Fellow at the Harvard Business School. He has published several books and articles in international and national journals. His areas of interest are strategic management, economics of organizations and organizational design, industrial economics and game theory, and information systems. Robert D. Nixon is an assistant professor of Strategic Management at the A.B. Freeman School of Business, Tulane University, where he teaches strategic management, global strategic management, project management and organizational theory at the undergraduate, masters and doctoral levels. Dr Nixon earned his engineering degree from Brigham Young University and his PhD in Strategic Management from Texas A & M University. Dr Nixon's research has been presented at the annual meetings of the Academy of Management, Administrative Sciences Association of Canada, Marketing Science Institute, and Project Management Institute. He has published in the Journal of Engineering and Technology Management, Entrepreneurship Theory & Practice, Marketing Science Institute and Organizational Dynamics as well as the proceedings of national conferences. His extensive industrial experiences encompass work for international, high-technology firms and the founding and management of more than a dozen entrepreneurial firms. The New Frontier (M. Hitt, et al.). INTERCONNECTED WORLD: THE GLOBAL ENVIRONMENT, UNCERTAINLY, AND KNOWLEDGE DEVELOPMENT. Competitive Policy Shocks and Strategic Management (P. Ghemawat, et al.). Firms' Strategies and National Institutional Environments (J. Bensedrine & H. Kobayashi). Perceiving Environmental Change and Strategic Uncertainty in the Central European Banking Industry (W. Hegarty & L. Tihanyi). Decision Processes and Uncertainty: Corporate Strategy in China (S. Fowler & M. Lord). Strategic Orientations of Chief Executives in State-Owned Enterprises in Transition (C. Lau). The Role of the International Corporations in Cross-Border Knowledge Transfer in the Semiconductor Industry (P. Almeida, et al.). Strategic Interaction, Knowledge Sourcing and Knowledge Creation in Foreign Environments-An Analysis of Foreign Direct Investment in R&D by Multinational Companies (W. Kuemmerle). Controlling Unique Knowledge Development as the Basis of Sustained High Performance (W. Bogner & P. Bansal). INTERCONNECTED FIRMS: THE ROLE OF COOPERATION, TRUST AND GOVERNANCE. Goverance of Interorganizational Partnerships: A Comparison of US, European and Japanese Alliances in the Pharmaceutical Industry (P. Bierly & E. Kessler). Strategic Alliance Formation and Market Evaluation: Effects of Parent Firm's Governance Structure (R. Hoskisson, et al.). Corporate Boards' Line of Reasoning-Comparison Between Corporate Governance in Poland and Sweden (J. Dzialo, et al.). Successful Technology-Based Strategic Alliances: An Entrepreneurial Perspective (G. Meyer & S. Alvarez). Strategic Alliances and Blocks: Cooperative Behavior as a Driving Force for Their Evolution (A. Ariño & C. García-Pont). The Virtual Organization: A Special Mode of Strong Interorganizational Cooperation (J. van Aken, et al.). How Firms Can Benefit from Collaborating within R&D Consortia (C. Mothe & B. Quelin). Acquiring Partners' Capabilities: Outcomes of Scale and Link Alliances Between Competitors (P. Dussauge, et al.). Relative Absorptive Capacity, Trust, and Interorganizational Learning in International Joint Ventures (P. Lane, et al.). Understanding Trust to Build Strong Relationships in Organizations (C. Portales, et al.). Value Appropriation in an Interconnected World (C. Park).